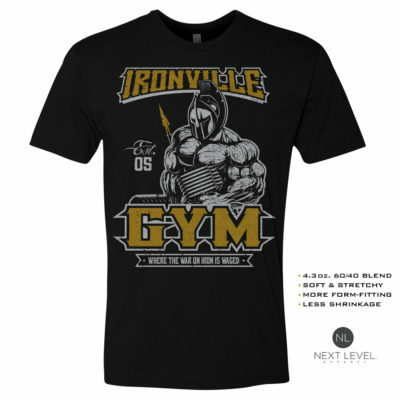 Ironville takes great pride in our reputation for quality workout apparel and accessories at discount prices. If for any reason you are dissatisfied with your Ironville purchase, we will assist you in a prompt refund* or exchange within 30 days of your purchase for all Ironville apparel. This applies to retail customers only. PLEASE NOTE: Shipping and handling fees are also non-refundable. If you have an exchange for the same dollar amount as the original purchase, no additional shipping charges will be incurred by Ironville. Simply ship your UNUSED & UNWASHED item(s) within 30 days (prepaid and insured, with tracking) to ensure a safe and documented delivery. Ironville will then promptly inspect and process the request for any applicable refund* or product exchange. If you are exchanging for a item that is more expensive than you originally purchased please enclose the difference in cash or check with your return. Or we can bill you for the difference via PayPal. Cash or check to include in your exchange shipment sent to us are as follows: $3.00 USD for any single item that is not a Hoodie or Sweatshirt. Enclose $7.50 USD for each hoodie or sweatshirt. Exchange fees can also be billed via Paypal if you wish. Returns or exchanges exceeding 30 days from your original purchase date will not be accepted. * PLEASE NOTE: All returned items will be charged a 20% restocking fee unless you were shipped item(s) that do not match your order details. Items that are returned in a condition less than which they were shipped out will not be refunded as said merchandise is deemed unsellable. We quickly recognize items that have been worn / washed / or dried, covered in pet hair, etc etc. Also: Do NOT remove any tags from inside the collar of our items before first trying them on for fit. Items with original sewn-in tags removed are not returnable. 1. Pack up your unworn and unwashed item(s). 2. Postage for the return shipment. Postage on exchanges is covered within the 20% restocking fee we charge for all returned items, unless we made a mistake in your original order in which case we will waive your restocking fee. Therefore, you do not need to enclose any extra money with your return to cover exchange shipping. Labels can be purchased and printed online at www.usps.com. You can also do so through your local post office branch, although the shipping rates are marginally higher. 4. Allow time for processing and delivery. We generally process exchanges within 2 business days of receipt. Make note of your tracking in case you need to reference updates on the returned order. If sending from abroad, times to receive the items may vary, based on Customs. All customers outside the USA please email us at [email protected] to inquire how much return postage fees should be included when shipping your item(s) back to us. Distributor and wholesale customers must read the disclaimer policy below. Wholesale and Distributor orders are made-to-order, and thus, NON-REFUNDABLE once payment is made. prior to placing an order. Duties and/or taxes may likely apply, but differ based on location. or it will be deemed as abandoned. No exceptions.